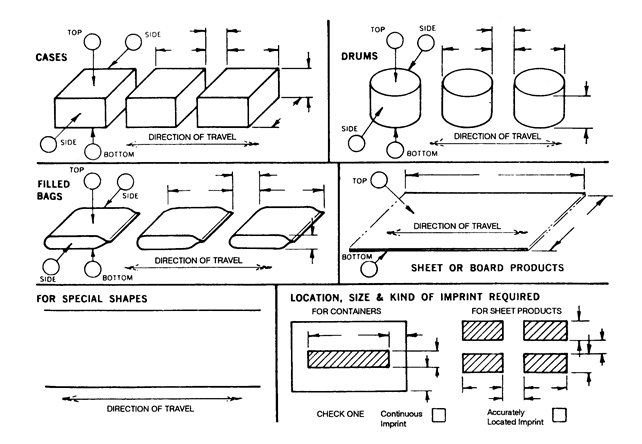 Application Evaluation Forms | Dalemark Industries, Inc.
INDICATE IN SPACES PROVIDED BELOW: Dimensions of your container or product, space between containers on the line, direction of travel, surface you wish to mark, size and location of continuous or accurately located imprint you require. Space is also provided for you to sketch in special shapes which are not shown, and other information, which when filled in, will help Dalemark evaluate your problem and make recommendations. Specify surface condition at the time of imprint. If imprinting equipment is to be installed in packaging equipment, specify name, type, serial no., model and other pertinent information.